KATHMANDU, Jan 11: Nepal Red Cross Society (NRCS) has been found splurging millions meant for earthquake victims on administrative activities and the purchase of various luxury items instead of channelizing the hefty amounts into the real tasks of earthquake reconstruction and rehabilitation. Documents obtained by Republica show that NRCS has already spent Rs 245 million given by various donors for reconstruction activities on salaries and allowances for its officials, foreign trips, the setting up of a sophisticated office, and the purchase of items like cars, motorbikes, scooters, computers, pen drives and other accessories. The documents show that NRCS has already spent Rs 62.3 million on salaries, honoriums for steering committee meetings and allowances. Sources say Nepal Red Cross spent much more than stated on a number of meetings and purchases. The humanitarian organization has been found paying hefty amounts and without any fixed criteria to its office bearers and staff working for its Emergency Response Operation (ERO) unit. The unit runs various post-earthquake projects in the 14 most quake-affected districts. Chairman of NRCS Sanjeev Thapa has been receiving Rs 125,000 as a monthly salary since the last one and half years while General Secretary Dev Ratna Dhakwa has been receiving Rs 98,349 per month and Treasurer Devendra Bahadur Pradhan Rs 63,249. Interestingly, NRCS has been paying Rs 40,000 to Bhatka Khawas, a member of NRCS's high powered committee formed to oversee reconstruction activities of the ERO unit, as a monthly salary even though he has been living in Canada for the last few months, according to a highly placed source at NRCS. Likewise, other staff working for the unit at the central and district levels have also been receiving unusually high salaries. A program manager receives up to Rs 121,500 monthly while project coordinators are receiving Rs 101,500. The staffers have also been given Dashain and other allowances. Around 70 staffers are working at the central level of the ERO unit while more than five staffers have been deployed at the district levels. Salary details obtained by Republica show that there is a discrepancy in salary among officials in the unit working in the same position. Likewise, the documents also show that Chairman Thapa has received Rs 250,000 as pocket money for his Geneva visit and Rs 72,735 for a visit to Thailand, among others. Similarly, NRCS has been found spenting Rs 49,084,100 for the purchase of cars, spare parts and insurance and also for hiring cars and vans during district visits by office bearers from the capital. The documents show that NRCS purchased over 10 cars. NRCS has purchased cars worth up to Rs 6,080,000. The documents shows that NRCS purchased two cars worth Rs 56,75,000, four cars worth Rs 3,395,000, 1 car worth Rs 3,065,000 and another worth Rs 1,065,000. Similarly, NRCS has purchased over 200 motorbikes and scooters worth Rs 61,251,281 and Rs 429,219 worlth of bicycles, and Rs 36,285,589 for purchasing trucks. The documents show that the humanitarian organization has purchased motorbikes worth up to Rs 480,000 for staffers. NRCS has also spent Rs 25,766,138 for laptop computers, Rs 4,032,122 for desktop computers, Rs 3,583,550 for computer printers and Rs 373,816 for flash drivers, pen drives and power backups. Similarly, NRCS has spent Rs 998,338 for purchasing multimedia optima projectors, Rs 423,217 for overhead projectors and Rs 209,744 for various computer accessories. “A huge amount of money issued in the name of NRCS is being spent on salaries and various luxurious items. Facilitates and salaries given to staffers overseeing reconstruction are no less than for I/NGOs officials. It is unfortunate that the office bearers are taking money meant for quake affected victims,” an official said. The official said that various donors have provided Rs 9 billion to NRCS for reconstruction and rehabilitation activities. “There hasn't been any real work on the ground. 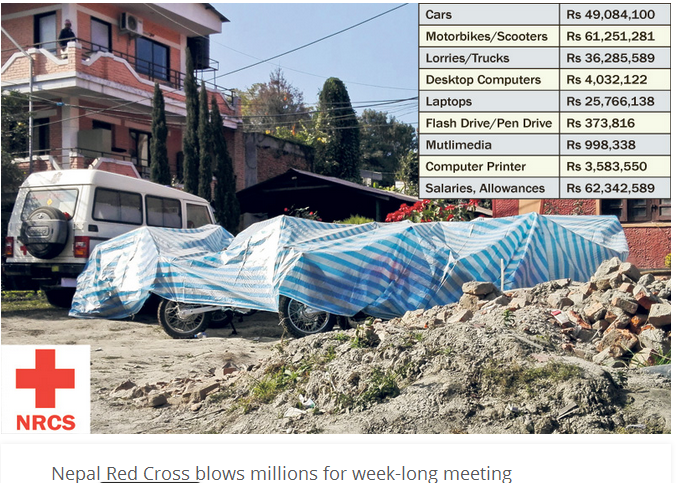 Red Cross is busy buying expensive items for its headquarters in Kathmandu,” said a highly placed official source. Earlier, Republica had found Nepal Red Cross spending more than Rs. 7 million for a lavish meeting at a fancy hotel in Chitwan.